The season's hottest trend? Denim in every color of the rainbow. Brights, pastels and eye-popping prints are redefining the jean pool. Sweatshirt, Uniqlo, Uniqlo stores, $20. Shirt, Aéropostale, aeropostale.com. Jeans, LC Lauren Conrad, Kohl's stores and kohls.com, $54. Glasses, Warby Parker, warbyparker.com, $95. Necklace, Loft, loft.com, $39.50. Cuffs, Ted Rossi, tedrossi.com, both $90. Studded bracelets, model's own. Heels, Milanoo, milanoo.com, $78. Shirt, Ann Taylor, anntaylor.com, $78. 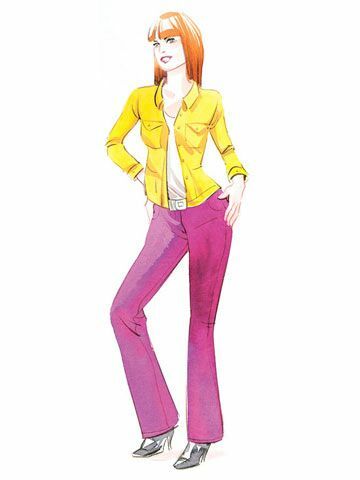 Jeans, W118 by Walter Baker, 712-996-1620 to purchase, $158. Bag, Mad Style, qvc.com, $27. Shoes, Yosi Samra, kokopalenki.com, $70. Shirt, Riders by Lee, Walmart, Kmart and ridersbylee.com, $20. Jeans, Jolt, Nordstrom and nordstrom.com, $58. Hat, Uniqlo, Uniqlo stores, $20. Gold bangles, Blu Bijoux, maxandchloe.com, $32. Sunglasses, Warby Parker, warbyparker.com/pencils-of-promise, $95. Bag, Run Run Run, runrunrun.com, $18. Shoes, Clarks, clarksusa.com, $100. Blazer, Lands' End, landsend.com, $95. Sweater, Dex, piperlime.com, $89. Shirt, Coldwater Creek, coldwatercreek.com. Jeans, Two by Vince Camuto, vincecamuto.com, $89. Shoes, Nine West, ninewest.com, $69. Jacket, Karen Kane, karenkane.com, $198 (discounted price with code FAMILYCIRCLE). Jeans, Old Navy, oldnavy.com, $34.50. Hat, Top of the World, lids.com, $16. Bag, Patricia Nash, Macy's, $128. Shoes, Sperry Top-Sider, sperrytopsider.com, $198. Jacket, W118 by Walter Baker, walterbaker.com, $167 (discounted price with code familycircle). Shirt, W118 by Walter Baker, Macy's, $78. Jeans, Big Star USA, bigstarusa.com, $95. Scarf, Echo, echodesign.com, $68. Bag, Prabal Gurung for Target, target.com, $40. Heels, Topshop, topshop.com, $96. Shirt, J.Crew, J.Crew stores, $138. 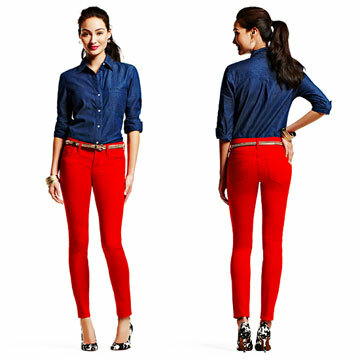 Jeans, Lauren Jeans Co., select Bloomingdale's stores and bloomingdales.com, $119. Sunglasses, Warby Parker, warbyparker.com, $95. Earrings, Blu Bijoux, maxandchloe.com, $22. Bag, Loft, loft.com, $39.50. Shoes, Nine West, zappos.com, $69. Blazer, Loft, loft.com, $98. Turtleneck, Uniqlo, Uniqlo stores, $30. Jeans, Nautica, nautica.com, $59.50. Hat, Echo, echodesign.com, $35. Earrings, Blu Bijoux, maxandchloe.com, $36. Cuffs, Ted Rossi, tedrossi.com, both $90. Watch, Isaac Mizrahi Live!, qvc.com, $31.50. Bag, Jennifer Lopez, kohls.com, $49. Heels, Loft, loft.com, $79.50. 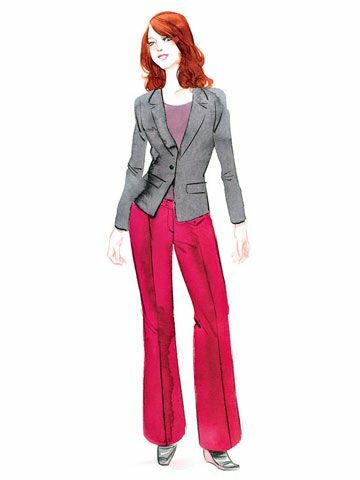 Avoid gapping with a contoured waistband—one that's slightly higher in the back than in the front. Try styles from Old Navy and Loft. The rise is the distance between the bottom of the waistband and the bottom of the crotch. A mid-rise, about 8 to 10 inches, will slim your middle. Most backsides look best in plain pockets (no flaps, distressing or embellishments). Skinny styles are flattering at just about any length. If they're a bit long or your shoes have an ankle strap, just roll the hem twice, keeping the cuff thin and slightly messy for a stylish, relaxed look. Never roll wide-leg or bootcut jeans, though. Those should fall about 1/4 inch above the floor (with shoes on). Opt for a little spandex: 2% holds you in comfortably (not breathlessly) and won't bag or sag. The typical inseam measures around 32 inches, which generally works for someone in the 5' 3" to 5' 7" range. 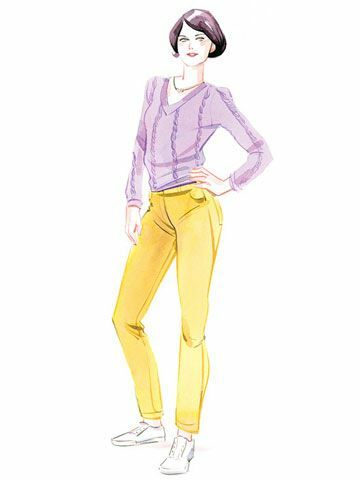 Some labels, like Gap and Lucky Brand, offer petite and long lengths for a more custom fit. Shirt, Riders by Lee, Walmart, Kmart and ridersbylee.com, $20. Jeans, Denizen from the Levi's brand, Target and target.com, $28. Earrings, Margaret Elizabeth, margaretelizabeth.com, $68. Belt, Nine West, Macy's, $38. Bangles, Blu Bijoux, maxandchloe.com, $32. Heels, Loft, Loft stores and loft.com, $79.50. Best if you're hourglass shaped. Wear with a structured blazer and tee. Add wedges or heels; flats will make your legs look short. 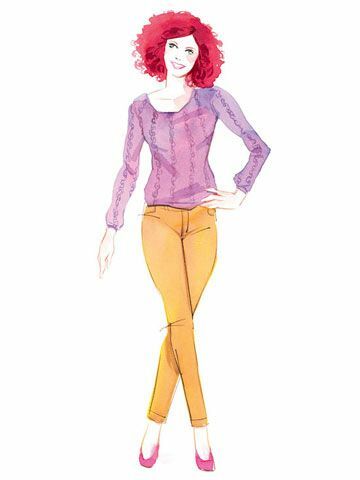 Try styles from Coldwater Creek, Macy's, Chico's. Best if you're narrow or boy shaped. Wear with an untucked blouse or loose-fitting top. Add ballet flats, pumps or boots—skinnies work with nearly any shoe. Try styles from Aéropostale, Express. Best if you're fuller in the middle. Wear with a V-neck sweater or fitted top. Add casual flats or sneakers. Try styles from Jones New York, Eddie Bauer, Lee. Best if you're any size! This style is universally flattering. Wear with classics like a jean jacket and tank. Add heeled boots or booties. Try styles from Not Your Daughter's Jeans, Levi's. Originally published in the February 2013 issue of Family Circle magazine. This piece was accurate at publication time, but all prices, offerings and styles are subject to change.